As the hit theme song of the renowned show Golden Girls goes, “Thank you for being a friend. Traveled down a road and back again. Your heart is true, you’re a pal and a confidant.” There is nothing quite like having a true friend – someone who you can always count on, someone who is loyal and someone who always has your back no matter what. Friendship, fitness and a whole lot of fun was celebrated at the 2018 Skechers Pier to Pier Friendship Walk, which took place on October 28, 2018 at the Manhattan Beach Pier in Manhattan Beach, California. It was a marvelous start to a beautiful Sunday morning honoring a great cause and supporting children with special needs and education. This year marks a very special year for the Skechers Pier to Pier Friendship Walk as it is the event’s 10th year anniversary. For ten years now, this outstanding event has impacted the lives of many and has helped provide a countless amount of resources to children with special needs. Participants and donors to the Skechers Pier to Pier Friendship Walk have helped create long-lasting and touching friendships for children with special needs and assist in the quality of local schools by improving class sizes, technology, programs and beyond. This year’s stupendous walk raised over a whopping $2 million – a spectacular feat that was only made possible through the help of all of the event’s supporters and participants. The Skechers Pier to Pier Walk allowed attendees to start off their day in an unforgettable way. This exceptional event brings together kids and some of their favorite celebrities and animated characters for an enjoyable day that can’t be beat. Each year, many celebrities come out to have a blast at this terrific event. 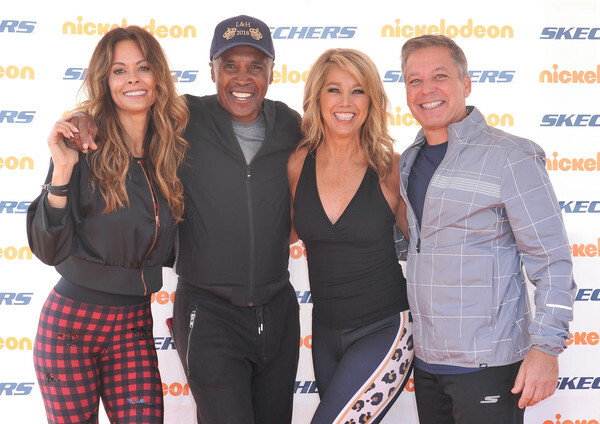 Avid supporters of the Skechers Pier to Pier Walk including Sugar Ray Leonard, Brooke Burke and Denise Austin attended the amazing event. In addition, Nickelodeon’s Knight Squad stars: Lilimar, Savannah May, Daniella Perkins, Lexi DiBenedetto, Amarr Wooten, Owen Joyner and Jaheem Toombs were also at the event. Other celebrities who attended included Jailen Bates, Dallas Young, Scarlet Spencer, Micah Abbey, Mackenzie Hancsicak and Isaiah Morgan. Many festivities took place at the excellent event. Special performances wowed the crowd at the Skechers Pier to Pier Walk. In addition, Brooke Burke and a personal trainer from Equinox got everyone up on their feet and ready for the exciting walk with a great, early morning warmup exercise. Then, it was go time. On your mark, get set, GO!!! and the Skechers Pier to Pier Friendship Walk began. Brooke Burke had a fabulous time at the event with her family. She shared the phenomenal photo below from the event as seen on her Instagram account. Family affair today..@skechers @skechersp2pwalk walking for a cause!!!!! Skechers President, Michael Greenberg was proud to talk about the success of the Skechers Pier to Pier Friendship Walk and how this year’s event garnered 14,000 people. Sponsors of the event had fantastic activations for attendees to get involved with. The Skechers Pier to Pier Friendship Walk is truly an incredible event for everyone to be a part of. It’s an amazing day well spent for families and friends to join together and walk for a brilliant cause. The Skechers Pier to Pier Walk creates extraordinary memories and friendships that will last a lifetime all while helping kids with special needs. I, Alexisjoyvipaccess had an excellent time covering the 2018 Skechers Pier to Pier Friendship Walk. This event never fails to leave everyone in awe with the work it does to make a difference in the lives of so many. The Skechers Pier to Pier Friendship Walk creates a great sense of community and it shows that when we work together, we can make this world a better place to live in. Check out some more pictures below from this year’s 10th Annual Skechers Pier to Pier Friendship Walk and be sure to follow @SkechersP2PWalk on Twitter and Instagram to keep connected with this stellar event. For more information on the Skechers Pier to Pier Friendship Walk and ways you can join the cause and donate, visit here. Next VIPAccessEXCLUSIVE: Musician Nacho Sends Out A Special Message To All Of His Fans With Alexisjoyvipaccess At The 2018 Latin American Music Awards!